In a visit to the Palestinian city, one can feel the influence of Israeli pressure on the Palestinian Authority, and the "Deal of the Century" isn't encouraging anyone. "As long as Jerusalem isn't on the table," people are saying there, "Trump's plan won't be, either"
Israeli elections approach. Tensions in Gaza. Disputed diplomatic moves over the Golan Heights. This and more moved the Two-State Index down by 0.2% this past month. For the full report, read here. For more on the Geneva Initiative's TSI, visit the website. The numbers are in: two states is still the preferred solution among Palestinians. 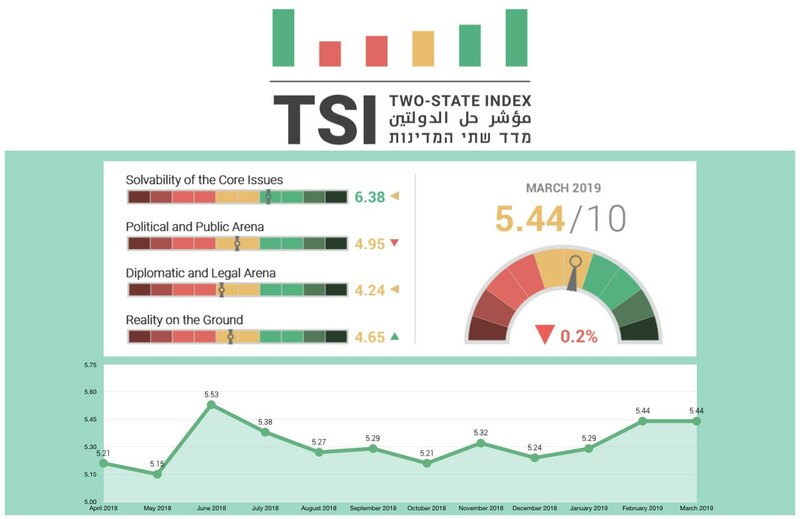 A recent poll by the Palestinian Center for Policy and Survey Research indicates an increase in Palestinian support for the two-state solution. 48% of the population supports the two-state solution, while 17% reported that they preferred the one-state solution, and 23% prefer a different solution. Read more about the findings here. Maya Glassman, the Israeli spokesperson for the Geneva Inititiative, participated in a joint delegation sponsored by Japan's Ministry of Foreign Affairs. The delegation was part of a program for young professionals dedicated to advancing peace in the Middle East. Over the course of the trip, Maya told participants about the Geneva model for a two-state solution and emphasized the immediate need to begin negotiations between the sides. Not many are aware of Japan's involvement in the Israeli-Palestinian conflict; Japan took part in the Madrid Conference and in the Oslo Accords process. The peace program that Glassman participated in has been running for over 20 years. Oslo and Camp David: One and the Same? Geneva Initiative's Yossi Beilin talks to Australian Jewish News about his friend of five decades Amos Oz, about his pursuit of peace and his involvement with the Geneva Initiative. Europe offers the American government advice over what will, and will not, make for a successful peace plan between Israelis and Palestinians.